It’s pretty clear that FC Barcelona is a better team than Real Madrid. I mean, they can keep the ball in the tightest spaces, and even a top club like Real were having a hard time keeping the ball on those rare occasions that they had it. As evidence, just look at Xavi Alonzo’s day. He was a mainstay in the Prem for Liverpool and he’s a Champion’s League winner, and he was having a hard time keeping up. But why the simulation? Why does Pedro go to ground holding his face? Why does Busquets still get to writhe around in pain and stay on the pitch? He did the same last year and got a guy sent off vs Inter Milan. Inter had to play the rest of the game with 10 men and somehow held on. The behaviour by the Barcelona players is a disgrace and a shame on the game. I understand why football and basketball loving Americans seeing stuff like this and realize that this type of soccer is a total joke. Those of us that love soccer need to figure out a way to make it change. Even other European soccer stars can’t believe the way Barcelona’s players are behaving and what they are getting away with. This year Dani Alvez gets a guy sent off by writhing around in pain, while most of the rest of Barca’s players crowd around the ref demanding a red card. Yet, no contact was made with Alvez’s foot (look on Real Madrid’s official site for video evidence of no contact.) Barca’s players are some of the most talented attackers on the planet (Messi, Villa, Xavi, etc.) but I can’t stand to watch them cuz of the cheating, the remonstrating against the refs when something goes against them, and the con-jobs they want the ref to believe when the shoe is on the other foot. 1. If you writhe around in pain, and then come back on and can fully sprint and participate in the game, you get a yellow card. 2. If video evidence shows (even after the fact!) that you got hit on your arm (like Pedro did) or your mid-section (like Busquets did), and you writhe around on the ground holding your face (like both Pedro and Busquets did), then YOU should get ejected from the game because you are trying to fool the ref and get someone else sent off. 3.Finally, if you come and crowd around the ref demanding a card for an opposing player, you should receive a caution. It’s a disgrace. I don’t want Man U to get another european title. I don’t want Man U to get another European title. I don’t want Man U to get another European title……but I am thinking it would be better than this group of simulators and cheaters and crybabies. Of which Messi is not one. That guy gets slammed around and is pure class. His dribbling thru 5 Madrid defenders was amazing to see. The ref will make the complete difference in the Champs League Final. It certainly did in the semi final yesterday. The Geordies are Back Up! Like most Newcastle United fans, I feared the worst when we were relegated at the end of the 2009 season. We expected a fire sale of our best players, especially after top players like Shay Given and James Milner were allowed to leave DURING a season we were struggling with relegation. It appeared the club ownership didn’t care about the club anymore, and that it would be reduced to tatters. In some ways this hasn’t changed. There are still many doubts about the seriousness of the ownership of Newcastle United Football Club. Are they in it for the long haul? Are they really looking out for the best interests of the club? Many doubts remain. Following Shay Given and James Milner out the door during the 2009 season, once relegation was certain, the likes of Michael Owen, Obafemi Martins, Sebastien Bassong, Habib Beye, and Damien Duff also were allowed to leave the club. Most of the players listed are starters for their Premier League or Bundesliga teams. With so many top players allowed to leave, the fear was that Newcastle would “pull a Leeds” and drop down to the 2nd or 3rd division of English Football. But it was not to be. 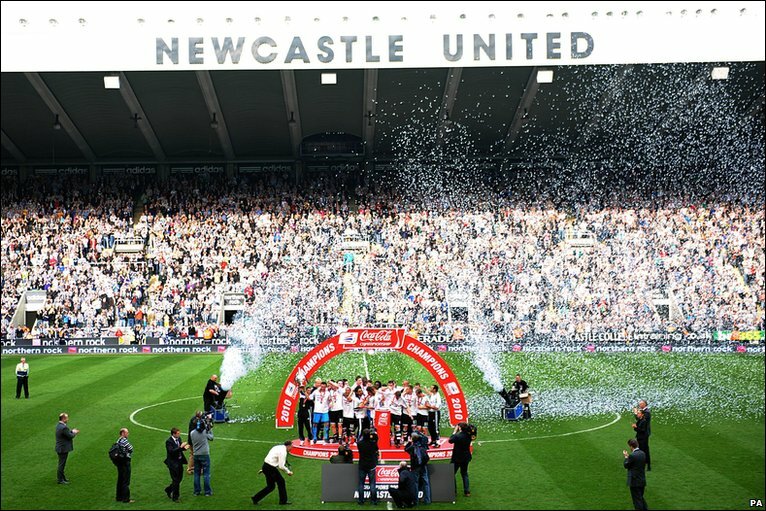 With a little luck and with a core group of committed players, as well as the improvement of players already on the team (I have Alan Smith and Steve Harper in mind here), Newcastle United has won the Championship Division – their first trophy in 17 years – and has made their way back to the English Premier League at first try. And it’s no more than the supporters deserve. They have not stayed away, coming out in droves and setting new attendance records for the Championship. Hopefully we won’t pull a yo-yo and go back down straight away — it really depends on if the owner decides to spend some money and strengthen the club in the off-season. Either way, we’ve done it at first attempt, and it’s great to be back in the Premiership once again. The Geordies are back up! Howay the Lads! I’m really glad that Landon Donovan has settled in the blue side of Liverpool. My friends and I have discussed Landon Donovan a lot over the years, and many people point to his 3 failed attempts to jump to the German Bundesliga as evidence that he is not a top-flight player. My argument all along has been that he has not been in a situation to “settle” well, but it doesn’t have to do with his playing ability. It might have been a coaching situation, a team dynamic, locker-room issues, etc. Or any combination of the above. My experience is that when you change to a new coach, or a new system, it’s not always easy to find your footing. I played under 4 different coaches between my years at Oregon State University and in the USL. Each had a different system and philosophy the players had to get used to. With apologies to anyone who doesn’t understand the NFL, a similar example is Darren Sharper of the New Orleans Saints. He was a pro-bowl caliber safety early in his career. Then his team changed (or he changed teams, I don’t actually know) to a different kind of defensive scheme, I think called Cover-2, where he was expected to perform different types of defensive duties. He basically sucked. For years. People thought he was washed up. But behold: he moves to New Orleans, back into a non-Cover-2 situation, and he’s back into pro-bowl form again, leading his team in take-aways and to a Super Bowl victory. Not a coincidence. Just like with every other sport, a player’s mental state and confidence are paramount to success. I kept claiming that Donovan wasn’t settling in Germany due to the dynamic within those teams – and it (finally!) appears to be right. I mean — Bayern Munich is not your best example of a settled club. They’ve been thru 4 coaches in the past 5 years. Super-stars from Italy and other countries are engineering their way out of the club. German national player Podolski hated his time at the club, and left. Luca Toni from the Italian national team got fed-up and left. I’m sure the Bayern faithful can tell me of even more players going thru the revolving door at the club. And we’re supposed to believe it’s Landon Donovan’s playing ability that has kept him from settling at Bayern? I’m not buying it. The best evidence of Landon Donovan’s playing ability is before our eyes at Goodison Park. Read it and weep all doubters. Now I know that he goes on “walk-about” from time to time during US National Team games. I have no rebuttal for that. But so does every other attacking player from time to time. (Defensive players don’t have that luxury!) Even Wayne Rooney gets subbed when he’s having an off day, just to make the point. But take a look at the goal Donovan scored against mighty, mighty Brazil in the Confed Cup last year (Here), and tell me he’s not one of the United States’ best 2 attacking options heading into World Cup 2010. Go ahead. I dare you.